The 3rd edition of this widely used resource offers superb guidance on diagnostic and laboratory testing for health professionals in both academic and clinical settings. The chapters are organized by test type and each chapter begins with a list of the tests covered within the test type, as well as an overview of that category including specimen collection techniques. The tests are presented in a consistent format that includes normal findings, indications, contraindications, potential complications, interfering factors, procedure and patient care, test results and clinical significance, and related tests. This full-color book is easy to use and covers virtually every clinically significant test, including more than 50 new to this edition. * A full color interior design and over 140 vivid color photographs and illustrations depict procedures, equipment, techniques, and concepts, making the content more visually appealing to the reader and the concepts easier to understand. * Comprehensive coverage of all diagnostic and laboratory tests routinely performed today. Over 700 individual tests are covered in approximately 360 entries. * Clinical Significances of test results, indicated in italic type, explain the pathophysiology of disease processes and how they relate to test results. * Color-coded chapter thumb-tabs, alphabetically organized chapters, and two lists of all tests (Appendix A, Alphabetical List of Tests and Appendix B, List of Tests by Body System) make every test easy to find. * Critical Values are highlighted with color to alert the reader to situations requiring immediate intervention. Excellent review for Health Care Professionals. a must have for any nurse...student or professional. 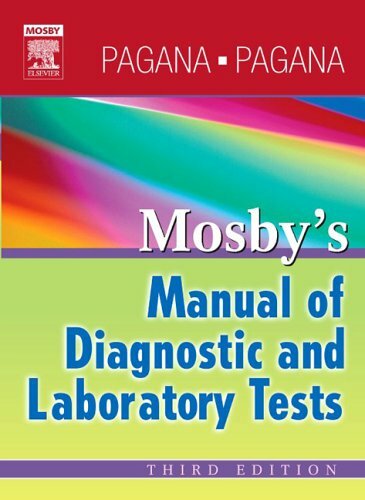 Be it biochemistry, microbiology, chemical pathology, parasitology or radiography, this book assembled all the clinical techniques that an investigating scientist would need. It is comprehensive and versatile. Detailed information were provided sequentially. Each section of the book describes all the relevant clinical procedures, using straightforward illustrations. Everything about it is practical. It is a versatile manual which every clinician and lab scientist, (including trainees), would value very much.